If you haven’t tried making homemade mac and cheese in an Instant Pot, you’re missing out! Not only is this recipe delicious, but it’s super easy to make. Using a combination of whole wheat elbow macaroni pasta and enriched elbow macaroni pasta, nutmeg, Cabot Salted Butter and Cabot Vermont Sharp Cheddar Cheese, this recipe delivers on flavor in a big way. But it doesn’t stop there! Sprinkled with a delicious bread crumb topping, you’ll love the taste and texture of this Instant Pot mac and cheese! Make and share the recipe on Facebook, Pinterest, Instagram, and Twitter with your friends and family. To make this recipe, start by tearing the whole grain bread slice in half and pulse it in a food processor to make breadcrumbs. Place in a small bowl and set aside. 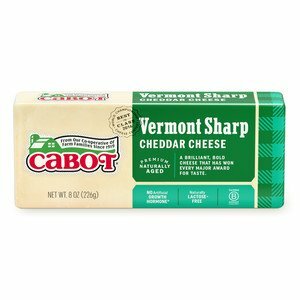 Switch to the shredding attachment on the food processor and shred the Cabot Vermont Sharp Cheddar Cheese and set aside. If you prefer, you can shred the cheese by hand. Place the whole wheat elbow macaroni pasta, enriched elbow macaroni pasta, water, one tablespoon Cabot Salted Butter, nutmeg and salt in the Instant Pot and give it a stir. Place the lid on the Instant Pot and set the lever to "sealing". Set on “Manual” for four minutes. Melt the remaining 1 tablespoon Cabot Salted Butter in a skillet over medium heat while the Instant Pot is going. Then add bread crumbs, stirring frequently until browned. Remove from heat and set aside. Turn the Instant Pot off when the four minutes of cook time are up and release the pressure by carefully moving the lever to "venting", always keeping hands and face away from the steam as it's releasing. When all of the pressure is released, and the silver float valve has dropped, carefully remove the lid. Stir in the shredded Cabot Vermont Sharp Cheddar Cheese and 2% milk, stirring vigorously until fully incorporated and the cheese is completely melted. Allow it to sit for 2-3 minutes to thicken slightly. Evenly divide the macaroni and cheese into bowls and sprinkle with the bread crumb topping and, if desired, fresh parsley. Can’t get enough mac and cheese? Try this Herb Mac & Cheese next! As a co-operative of over 800 farm families, Cabot is dedicated to creating the highest quality products and recipes that best showcase the fresh flavors of our products. Please share your thoughts on this Instant Pot mac and cheese with breadcrumbs after you’ve tried it by rating and reviewing the recipe. TEAR bread slice in half and pulse bread in a food processor to make breadcrumbs. Place in a small bowl and set aside. SWITCH to the shredding attachment on the food processor and shred the cheese (you can also do this by hand if you prefer). Set aside. PLACE both kinds of macaroni, water, one tablespoon butter, nutmeg, and salt in the Instant Pot and give it a stir. Place the lid on Instant Pot, and be sure lever is set to "sealing". Set on Manual for four minutes. MELT remaining 1 tablespoon butter in a skillet over medium heat while Instant Pot is going, then add bread crumbs, stirring frequently until browned. Remove from heat and set aside. TURN Instant Pot off when the four minutes of cook time are up and release the pressure by carefully moving lever to "venting" (always keep hands and face away from the steam as it's releasing). When all of the pressure is released and the silver float valve has dropped, carefully remove the lid. Stir in the cheese and milk, stirring vigorously until fully incorporated and the cheese is completely melted. Allow it to sit for 2-3 minutes to thicken slightly. PORTION macaroni and cheese into bowls and sprinkle with bread crumb topping and fresh parsley, if desired.